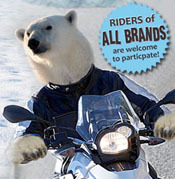 Join Bob’s 3rd annual High Mileage Polar Bear Challenge. All brand riders are encouraged to join in the fun and all you have to do is ride…it’s that simple! All riders must complete the Rider Registration Form. Registration begins the same day as Bob’s Holiday Cheer Open House: Saturday, December 19. Mileage check-in must be done in person at Bob’s BMW Service Department, Tuesday-Friday 9am-5:30pm and Saturday 9am-3:30pm; no appointment necessary. (Click HERE for specific dates). Want to participate but not “local”? If you are a member of a chartered motorcycle club and are interested in participating, contact hanna@bobsbmw.com directly for more details. Stop by Bob’s and get $7 OFF Tickets! Reg. $17 ONLY $10 at Bob’s BMW! 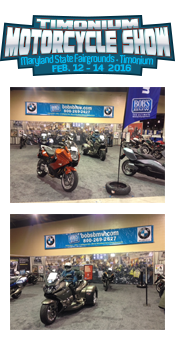 PLUS $7 OFF a Bob’s BMW T-Shirt with each ticket purchase! The Timonium Motorcycle Show is the best place to see the latest in gear, aftermarket parts and accessories, enjoy seminars, and see the newly Expanded Travel, Touring and Adventure Feature Area. JUST ANNOUNCED: Custom and Antique Bike Competition. R1200RS, S1000XR, S1000RR, K1600GTL Exclusive, K1600 GT Sport Blue, R nine T with a silver tank, R1200RT, F800GT, and F800GS. For a complete schedule of each day’s activities, click here.